Catherine Steinmann’s rich and elegant portraits capture in photographs what fails in words — that moment of transformation, a quiet before the storm. With a knowing eye she balances excitement with anticipation, the physical with the ethereal. A welcome addition to our photographic literature. PHILLIP S. BLOCK, Deputy Director for Programs, International Center of Photography Catherine Steinmann’s photographs show the beauty, hope, and joy at that moment that is most strange and most wonderful in the human condition—the ninth month of pregnancy. Rather than having the almost impossibly thin bodies of fashion models, Steinmann’s subjects have bodies that are full, human, and all the more sensual for it. This work radiates life at its most intense, ripe with possibility. STEPHEN PERLOFF, Editor, The Photo Review In our culture obsessed with thinness, the full form of the pregnant woman is generally considered something to be hidden away — covered up by maternity clothes and screened away behind private doors. Photographer Catherine Steinmann’s new book The Ninth Month gently but powerfully shatters this social taboo. It is a joyous celebration of the female body at its fullest: in the ninth month of pregnancy. Steinmann has spent two decades photographing pregnant nudes. Her sensitive and empathetic eye captures not only the pregnant body’s graceful form, but also the experience of pregnancy in a most life-affirming light. Her photographs are sensuous, personal, and strikingly graphic. The trust between photographer and subject is clearly evident, as is Steinmann’s skill in coaxing each subject to express herself in her own way. “I wanted the mother to show how she felt,” she explains. “The photo session should be full of surprises, just as having a baby is full of surprises.” The Ninth Month is lavishly designed in square format, with velvety subtle tri-tone reproductions on warm matte paper. The photographs are organized into two sections: “New York” and “Kaua‘i.” “New York” introduces subjects who pose with expressive translucent fabrics against a plain background or mirror in the studio. Some of these images are abstracted close-ups; others are portraits with a strong emotional component. “Kaua‘i” presents photographs made on this idyllic Hawaiian island, where Steinmann lives part-time. These are infrared photographs in which the women are either in water or at the water’s edge, basking in glowing light. These photos are ethereal, otherworldly, like visions of Paradise. Steinmann offers these sublime experiences and images to women in their ninth month — in part, as an antidote to their discomfort, stress, and possible fears about the labor to come. She also creates these photographs for their future children who will inevitably ask, “Mommy, where did I come from?” Steinmann’s text provides behind-the-scene insight into her process as a photographer, including some delightful accounts; for example, of crashing waves awakening the gestating babies, and of photo sessions requiring cancellation due to the subjects’ water breaking. 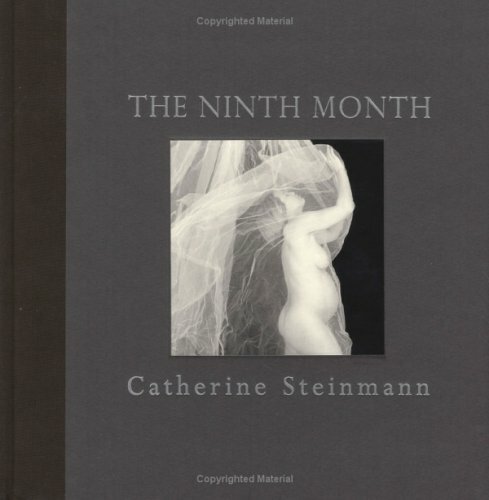 Her compassion for her subjects is eminently clear as when she offers the observation, “My camera is simply a mirror reflecting their souls.” The Ninth Month is Steinmann’s second book on this topic. Her first book, Pregnant Nudes (1994), received widespread acclaim and was one of the top-selling books at the International Center of Photography, New York.